As of late, the mortgage interest deduction (MID), a tax break many Americans have become accustomed to, has become the focus of much debate and controversy. It first became the subject of heated discussion when President Obama’s debt commission suggested its reduction. They argued that in addition to reducing deficits, such reform could also help slow the growth of sprawl. The claim was that the deduction encourages people to buy larger homes on larger, exurban lots, and that reducing this subsidy would slow the growth of sprawl. In a previous post, I argued that the MID is only one of many incentives that have made sprawl the predominant form of growth. What’s more, slowing growth does nothing with the huge surplus of sprawl that already exists. If the goal is to effectively deal with sprawl, we will be better served by encouraging its repair through regulatory and financial incentives. Now the MID debate has started anew as President Obama suggested funding portions of the Jobs Act through certain reductions of the MID. And yet again the result has been uproar from all directions. It is obvious that any proposal to reform this all-American “privilege” will be an uphill battle. Here is another proposal. We know that sprawl is a disaster of biblical proportions and that we will need to deal with it sooner or later. 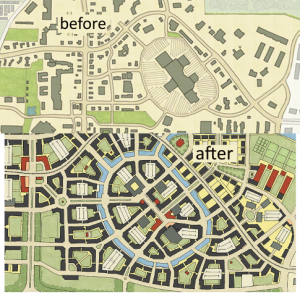 Why not modify the MID to encourage the repair and redevelopment of our sprawling communities? We need to create incentives for density and mixed uses. Sprawl happened not only because people wanted big houses and privacy, but also because the policies and incentives, such as the MID, were very attractive. The MID could be reduced for all properties except those in locations targeted for sprawl repair and redevelopment. This would create a strong incentive for people to buy and build in places that need infill and densification. If that action proved to be politically unfeasible, the MID could be increased for investments in sprawl repair sites, such as dead malls that could be transformed into mixed-use town centers and failing commercial strip corridors that could be made viable as transit-oriented boulevards. The above strategy could be applied in combination with state and local policies such as legislation encouraging smart growth and reformed zoning codes, to deal with the enormous and complex phenomenon of sprawl. However, real leadership will be required to successfully pull off sprawl repair. Forward thinking and political courage will be needed to change the status quo. These leaders must understand that great place-making invigorates local economies. Recent studies show that dense cities create more jobs and expand markets. It is not a coincidence that these places are not only dense, but also demonstrate great urbanism, attracting the entrepreneurial and the talented. Incentivizing sprawl repair, transforming struggling or failing places into spots of great urbanity, would benefit larger regions and help the economic recovery.